Growing up in the early ’60s in Winnipeg, I was used to going to movies by myself in junior high: ’61-’64. American International Pictures was in its heyday, particularly with adaptations of the works of Edgar Allan Poe. These movies were often scary and funny for junior high kids. Many years later I came to own these movies, including all the ones made by Roger Corman (who mentored Coppola, Scorcese and other subsequent maverick directors. 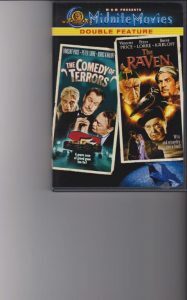 Yesterday evening, I watched The Comedy of Terrors, one from 1964 that wasn’t directed by Corman, but which was written by Richard Matheson, who wrote also many of these classics. What great fun with Vincent Price heading the stellar horror cast as a corrupt undertaker, Peter Lorre (who is always fun in the Poes) as his underling who has eyes for the bosomy Joyce Jameson, Price’s neglected operatic wife. Boris Karaloff is the wife’s deaf father whom Price is trying to poison. Basil Rathbone plays a recurringly not-so-dead corpse and steals the show, quoting from Macbeth throughout the attempts to bury him! Funnyman Joe E. Brown is a quirky Irish grave attendant with the best scream during the climax. Very simple, straightforward, but still humorous fare after all this time. Timelessly perfect, in particular for junior-highers who like more obvious humor like farce. 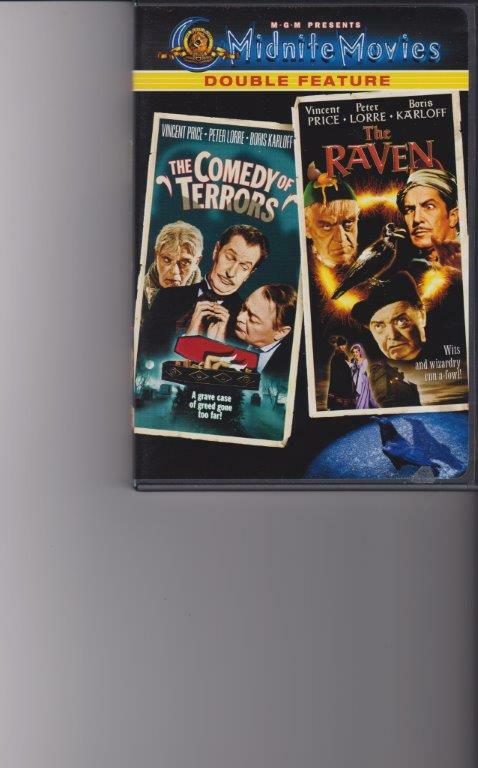 Also on the DVD is a very funny version of The Raven. (Most of the series DVDs are ‘twofers’. My own personal favorites in the series are The Masque of the Red Death (a very serious version with undertones of Bergman’s The Seventh Seal) and Tales of Terror (especially “The Facts in the Case of M. Valdemar”).